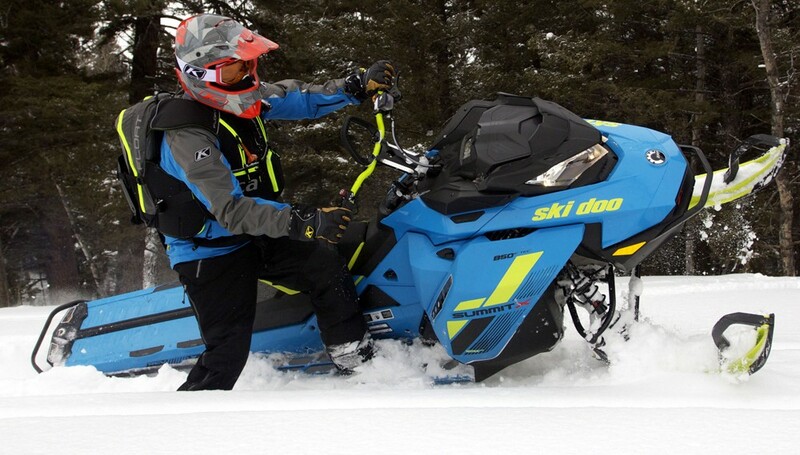 Before we dig into our 2018 Ski-Doo 850 Summit X 175 review, it would help too look back at some Summit history. Eighteen winter seasons ago, Ski-Doo had a money-making season where the Canadian company launched to the mountain riding fan its model year 2000 Summit Highmark X 700 Extreme Traction 151. This ZX chassis Summit was a leap from the 136 Summit of 1999. In 2000, three track lengths were available: 136, 141 and 151, with the 151 being a special-order unit. Many westerners saw the 151 as too long and potentially unwieldy. These naysayers, for the most part, had never ridden anything longer than a 136. These “nay” voters believed they knew more about riding in the steep-and-deep than Ski-Doo. I was one of those. As a journalist, I ordered the 141. What I got was a bright yellow 151 Summit Highmark X Extreme Traction. Radical? Yes. Long? Yes? Cumbersome? No. I’ve never looked back. Enough about me. Upon the arrival of the 2000 151 Summit, Yamaha, Polaris and Arctic Cat saw money flow into Ski-Doo’s piggybanks. These OEMs had to catch up. At the time, 136-length mountain snowmobiles were the norm, and exploring into the 141- and 144-length chassis was just beginning. The 151 Summit from year 2000 was the first exclusive purpose-built ultra-long track mountain snowmobile where its track, tunnel, rear suspension, and dropped and rolled chaincase set an unusually high mark for the other three OEMs to match. The Summit also had its unique carburetor altitude adjusting mechanism – HAC – for High Altitude Compensating. This mechanical system, sensitive to barometric pressure, adjusted fuel flow for thin air. In a stealthy black color, the 175 Summit X shows off its skinny lines and awesome ground clearance. Designed for deep powder, the longest Summit X is light handling. The Summit Highmark X 151 Extreme Traction was a pioneer. As a younger journalist, I wrote a long-term report on the Summit Highmark X Extreme Traction stating the bright yellow snowmobile covered mountain sides like trees. The other OEMs caught up. Lengths stayed within 151 to 153, suspensions and skis became powder compliant, and electronic fuel injection (EFI) replaced mechanical altitude compensation. Then in 2005, Polaris rolled out a 166 RMK in its IQ/Fusion chassis – the famed 900 RMK. 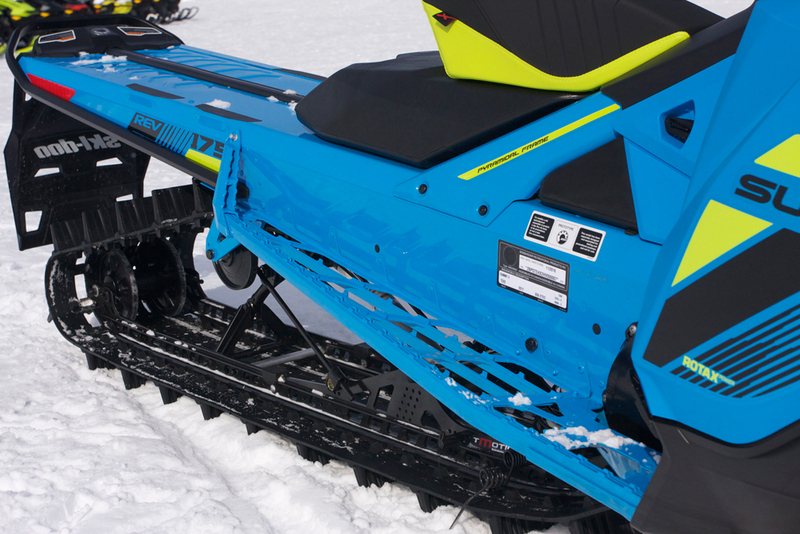 We could write a 200-page novel on the 900 RMK and how it bruised its parent, Polaris. Yet, to make the jump from a 151 to a 166 seemed monumental. By the way, the 900 RMK was Polaris’ greatest lesson learned. This chassis was shot and left to die, taking much research and development money with it. 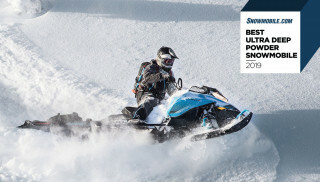 Just three short seasons ago, Ski-Doo took another stab at the ultra-long long track market and delivered its REV XM Summit X 174; the year 2015. This made Ski-Doo’s 163 Summit the middle-height child, and 154 the shortest. With its XM chassis and 16-inch wide track, many riders bought the 174. Was it received without discussion? No. Ski-Doo is a mold-breaker. In the deepest sauce, the 174 was a happy Summit; in packed snow, not so happy. The 170-something length snowmobile, particularly the AXYS Pro-RMK 174 LE and the 2018 Ski-Doo 850 Summit X 175, are controversial. Not that controversial is a bad thing, it is not, in that the mountain rider understands that length equals float. Mountain riders also understand that length means planted, that is reduced nimbleness or agility. Polaris minted the phrase, “Flickable,” for its Pro-RMK line. However, “Flickable” is reduced to lowercase “flickable” when it comes to the 174 and 175. The one-inch shorter steering post, and mountain rider ergonomics creates a perfect fit for rider and machine, meaning little effort is needed when in wrong foot forward stance, to lay the Summit X 175 to its edge and begin a carve. The motor and suspensions react well to rider input. Within the Snowmobile.com fleet of eight snowmobiles for this winter season, was a 2017 Polaris Pro-RMK 174 LE, which we rode in deep southeast Idaho and southwest Wyoming powder. We’ve also spent ample time on a 2017 Ski-Doo XM Summit X 174, and with that, a full day on Ski-Doo’s next generation Summit, the 2018 175 Gen4 Summit X and SP. We rode these in some deep powder near Sicamous, British Columbia. From these 170-plus length snowmobiles, this author concludes, I’m willing to give up some agility (“flickability”) for float. This is an unsettled topic within the mountain program here at Snowmobile.com; several of our guest-test riders are hardened 162/163/165 riders. It’s good to have some debate amongst ourselves. 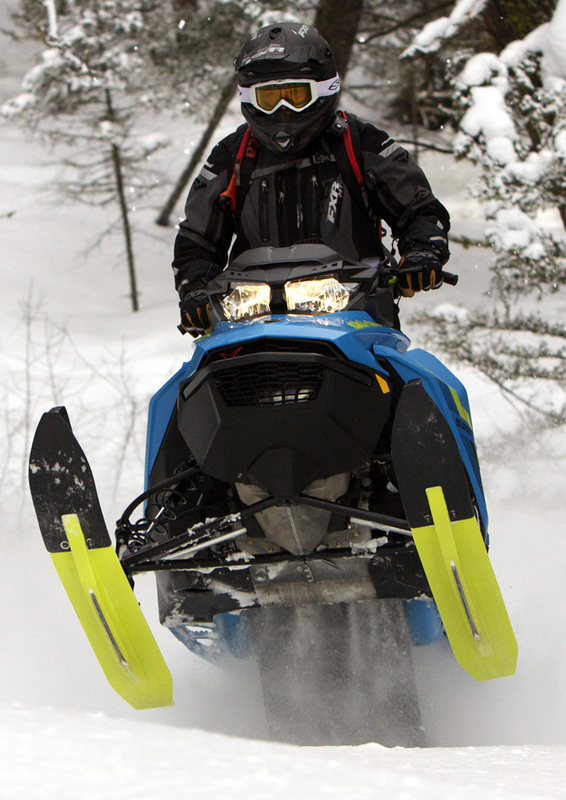 The Pro-RMK LE 174 and the new GEN4 Summit X 175 are fairly nimble, given each snowmobiles’ respective chassis. But, as age continues to challenge many mountain riders’ personal agility and nimbleness, a mountain sled that is planted, that floats, and one that stays tied to a mountain side during a long sidehill sweep, is not a bad thing. The 2018 Summit X 175, especially one equipped with the splendid SHOT – Start Hot – is a super long, long track snowmobile that ought to be considered for the upcoming winter season. Here’s why. The happy Start Hot button – SHOT. 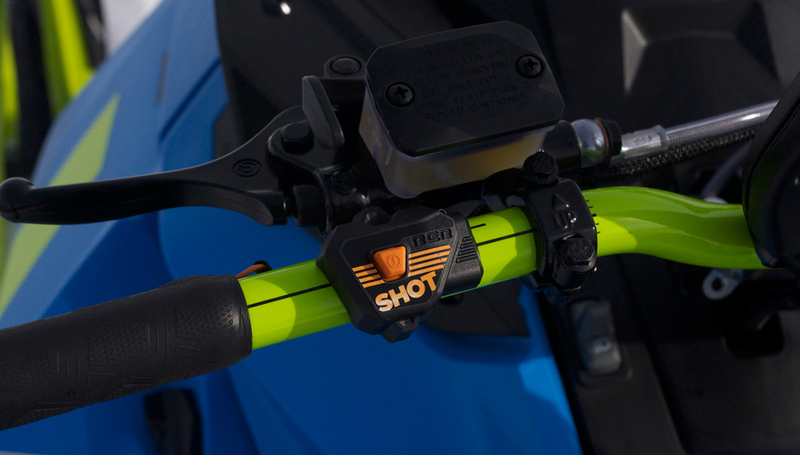 This combo, battery-less electric start and RER button is revolutionary for mountain riding. The 2018 175 Summit X has the 16-inch wide Powder Max II track that is light, due to its 3.5-inch pitch. With paddles that are spaced far apart, the track is light and does not cut and blow out the snow. With the math, this track has a total footprint of 2800 square inches. Being half the track is on the surface at all times, 1400 square inches of track with three-inch paddles propels the 175 Summit. Second, the 175 Summit X comes in the REV GEN4 chassis with 850 power. How sweet is that? 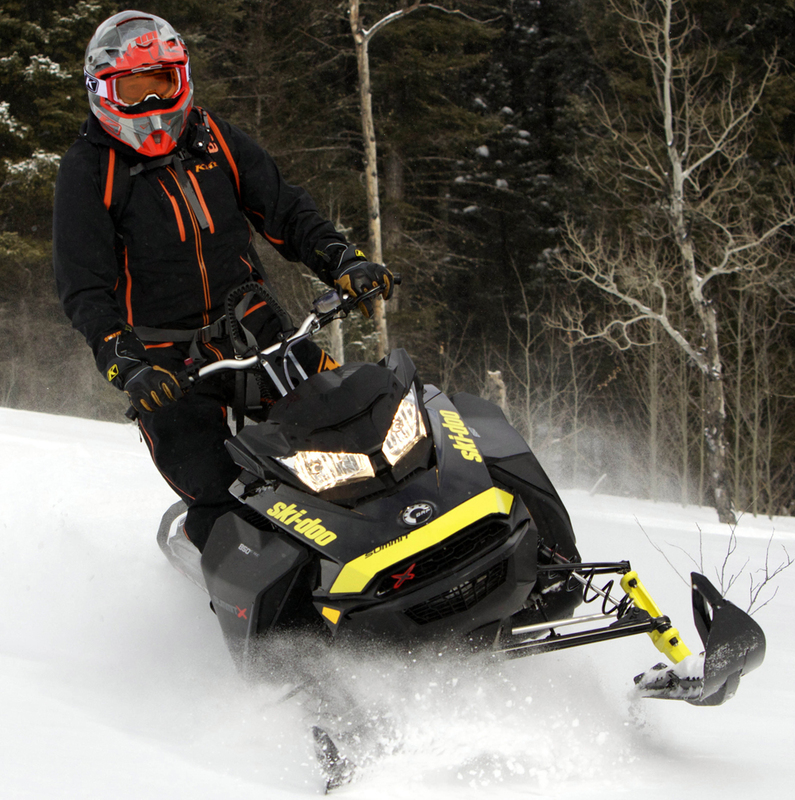 With a wide powerband, to include bottom end grunt from this large displacement motor, the Ski-Doo 850 Summit X 175 will hold its torque down low for those times when you need to creep up a steep slope or through thick, tightly-spaced trees. Walking the 175 Summit X up a steep ascent may be too easy. This long Summit makes easy work out of steep hills. Third is tMotion where the whole rear skidframe package, to include the tMotion rear suspension and FlexEdge track, enhances the two 175’s nimbleness. After spending several days aboard the Ski-Doo 850 Summit X 175 in British Columbia and in the mountains near West Yellowstone, Mont., the Summit X can still wash out on a hillside, if the rider is not positioned correctly up towards the front, and leading with the outside foot when in wrong foot forward riding. This is true for all long track snowmobiles. But, 175 owners should not toss away knowledge for length, riding the 175 like it is a 165 is still the call. We’ve been asked if the 175 can lift its nose and pack its skis like a 165 Summit X. Yes and no. Its stout motor will pack its skis, but not like a 165. 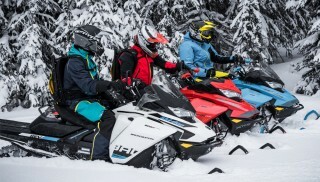 Furthermore, like any smart owner with a smart mountain snowmobile, adjusting the rear suspension to body weight, terrain, and snow condition is key to smart riding. Want more lift? Dial it in. What less ski lift? Dial it out. Riders who accept “average” suspension settings are only experiencing an “average” ride. Another question we’ve been asked is how the Summit X 175 compares to the Pro-RMK 174 LE. The Summit X 175 feels livelier, less planted, but that is how Ski-Doo set up the 175 Summit Xs we rode. If more ski pressure was given to the 175 Summit, it would have behaved like the Pro-RMK 174. Conversely, the 174 Pro-RMK can be set nose light as well. In summation, the Summit X with its strong motor feels more energetic. Yes, it has lift, taking the 175 to an airborne position is simple with its 850 power. 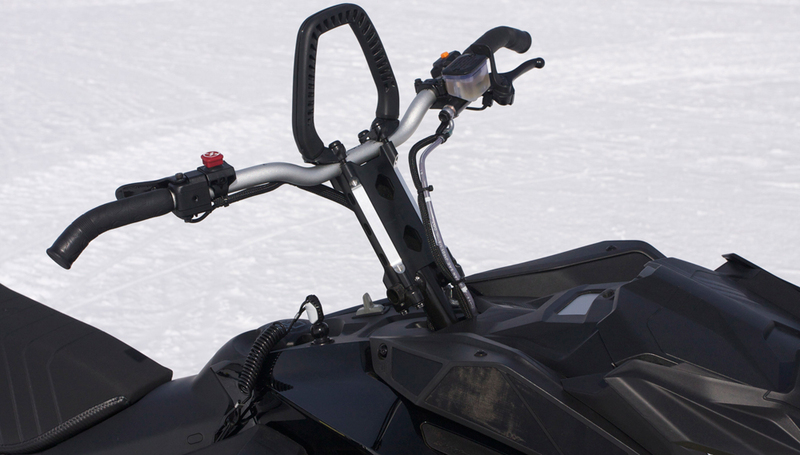 The one-inch gain in length for the Ski-Doo 850 Summit X 175 compared to the outgoing 174 is due to BRP using a 3.5-inch pitch Powder Max II FlexEdge track. The 175 Summit X is five inches longer than the 165 – in total vehicle length. 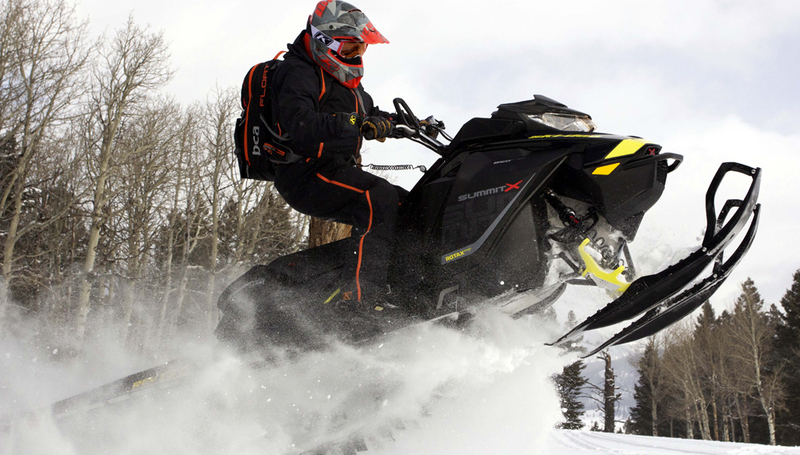 Ski-Doo felt the 175 needed further engineering soak time – to test and retest – the 175’s lengthened rear suspension with new 3.5-inch pitch Powder Max II track. Ski-Doo’s engineers spread the tMotion rear suspension’s scissor and mounting points, lengthened the torque rods, added a longer front rail shock, and lowered the skidframe’s mounting bolt positions (on a longer mounting plate) to the tunnel to give the long track flotation, a 165-like turning radius and too, 165-like agility. For Rocky Mountain boondocking and hill climbing, the 2018 Summit X 175 will ascend to dizzying heights, float atop the deepest powder, and carve Figure-8s with a feathery touch to the bars and minimal pressure on the boards. As we learned from riding the 175 alongside the 165, this longest Summit does involve slightly more effort to drive than the 165, but as mentioned, it is feathery light. The runningboards on the 175 Summit X are narrow like those on the 154 and 165. Narrow runningboards help prevent ‘paneling out’ when on a sidehill. The Spring-buy Summit X can be ordered in black with a yellow nose or the highly visible octane blue with manta green. The SHOT starting system is optional. The three-inch Powder Max II track is the best choice, but if so desired, the 2.5-inch Powder Max II is available. Lastly, Spring-buy customers can choose sea-level calibration for their Summit X; for those who live in Michigan’s Upper Peninsula, for example. We hope this is not out of place. But, speaking generally, with the advent of lighter and longer snowmobiles, comes the desire to scare-and-tear the steepest slopes that have the deepest powder; tree-covered or not. To that, be wise where you ride and when. This sport is replete with fun, but not deplete in some dangers, especially in the mountains. We suggest becoming avalanche smart. Place yourself in some hands-on avalanche classes, such as a course taught by Mike Duffy at Avalanche 1, or Bret Rasmussen at Ride Rasmussen Style. Ski-Doo is a huge proponent of avalanche education, for Ski-Doo wants its backcountry riders, in fact all backcountry riders, to live to ride another day; and to spend many long days with friends and family, and growing old. The beacon, probe, and shovel are for rescue – after the fact. Avy bags, the quick-deployment avalanche airbag, is not a preventative tool, but a hopeful personal life-saving tool when an avalanche is underway. The best tool is knowledge and practical training and testing. The long 160-plus and ultra-long 170-plus snowmobiles allow us to traverse deep and tall mountains that very few can; and what a thrill that is. 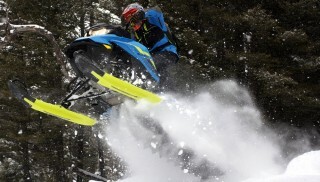 We love these long mountain snowmobiles for the freedom they provide. But, equip your brain with snow, slope and weather condition knowledge. Then go and enjoy the blessed Rocky Mountains on your long or super long track snowmobile, like the awesome 2018 GEN4 REV Summit X 175.